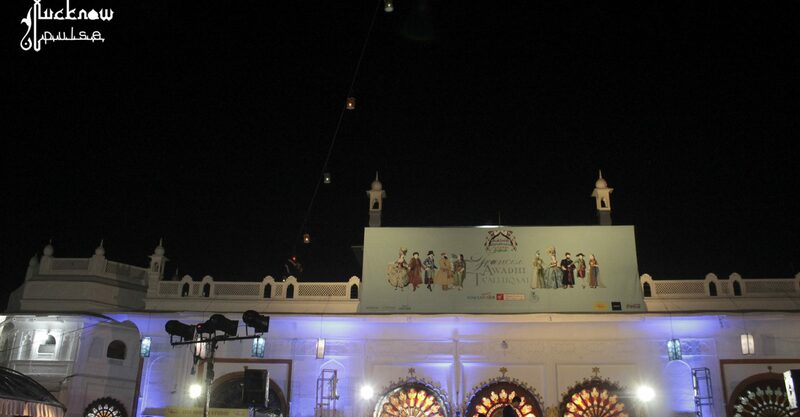 The Sanatkada Lucknow Festival celebrates the heritage of Lucknow. It was an initiative undertaken by Sanatkada, a creative non-profit in 2006 to promote the rich culture of the city through various activities. The festival holds a series of programs such as panel discussions, book reading sessions, exhibitions and film festivals. Food and handicrafts, not just from UP, but from across the country are showcased here. Organized every year between the end of January to mid-February, this year the festival was held between 2nd February and 6th February at the Safed Baradari, Qaisar Bagh. The festival is always based on a theme which is closely related to Lucknow, historically and culturally and the theme chosen for this year is Francisi Awadhi Taluqaat, to give an insight into the connection that the two diverse cultures – of France and Lucknow share. The food festival which is a key highlight of the festival included a ‘fusion biryani’ as a part of the exhibition. Although the festival is free for all, entry in the festival required a registration beforehand. Day one of the festival began with the Sanatkada Samajik Pehel – “Khel Khel Mein”, a series of gender sensitization games were conducted to understand gender identity and send out a powerful message. Keeping in mind the theme, ‘9-month stretch’ – a French comedy film, directed by Albert Dupontel and ‘Queen’, a Bollywood movie with a French Connection, directed by Vikas Bahl was also screened. The festival was inaugurated with the readings from Allan Sealy’s Trotter-Nama by Valentina Trivedi and Reflections from Syed Ahmad Ali Ambalavi’s ‘Luqma Laziz Bara e Farang’ by Noor Khan. The first evening had an Odissi dance performance at one of the most picturesque heritage backdrops in Lucknow – The La Martiniere College. Sriyah, an ‘Odissi’ dance presentation featuring a selection of new and old works created over a decade, was performed by Surupa Sen, Bijayini Satpathy, Pavithra Reddy, Akshiti Roychowdhury. The presentation has earlier been presented at the coveted and renowned platforms such as Edinburgh International Festival, Lincoln Center’s White Light Festival, Sydney Opera House and Cairo Opera House. Day two saw a series of heritage walks and car tours taking people through Claude Martin’s town house and country house, Begum Akhtar’s Mazaar and Qaiser Bagh and its homes. French films Tamara and A Few Hours of Spring were screened along with Bollywood film An Evening in Paris. A cultural performance Badaa Bhaand, based on a story by Vijaydan Detha was directed and performed by Ajay Kumar. Day three began with a vocal recital by Padma Talwalkar and a photo exhibition – Out of Frame – Collection of Photographs from Niépce Musuem, France. Corniche Kennedy was the French film to be screened and cultural performances included a Juggling & Dance performance by Francois Chat and the Mehfil-e-Mushaira. On day four, French films Villa Amalia and The Boss’s Daughter were screened along with the Bollywood release, Befikre. A literary discussion panel was held with Saeed Naqvi, Zakia Mashhadi on board as discussants and saw the book release of Fida-e-Lucknow authored by Parveen Talha and translated by Sabiha Anwar. The highlight of the day was the cultural performance – Dohri Zindagi: A play based on an iconoclastic story by Vijaydan Detha, Directed by Gurleen Judge, Play On Productions. Thus ended a 5-day extravaganza, giving a good dose of music, dance, drama, literature, cinema, history peeks, and above all, food and shopping that helped retain and reclaim a legacy that might otherwise get lost in this fast-changing chaotic world. The entire Sanatkada team led by Madhavi Kuckreja and Askari Naqvi needs to be applauded for yet another beautiful experience to Lucknowites and the visitors to the city.